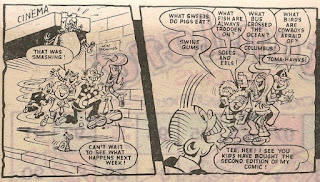 In this new series of posts I'm going to focus on the cut-out features that appeared during Cheeky Weekly's run (but not including the Pin-Up Pal posters which I've already covered here, and anyway, although the posters were clearly designed to be removed from the comic, readers weren't instructed to do so, which is the main criterion for features that will be included in this series). 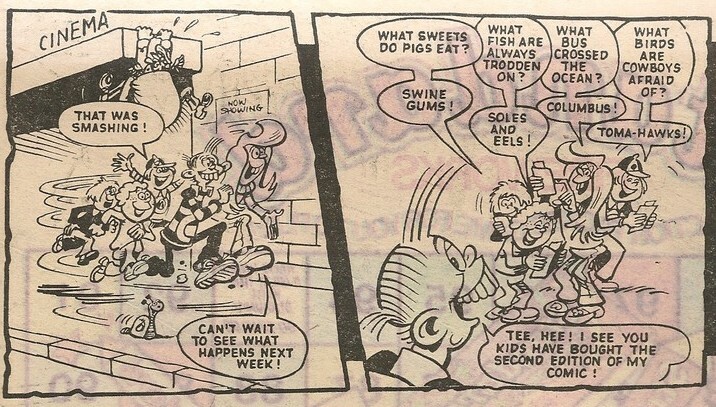 The first feature in Cheeky Weekly which included an invitation to excise it from the comic was the 'More Joke Strips' printed in the 12 November 1977 issue. The first cut-out feature can be seen here. 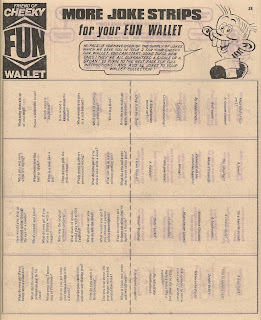 'More Joke Strips,' featured in the 12 November 1977 issue, were designed to supplement the strips printed as part of the Friend Of Cheeky Fun Wallets which were the free gift in Cheeky's Weekly's second issue, published a week earlier. 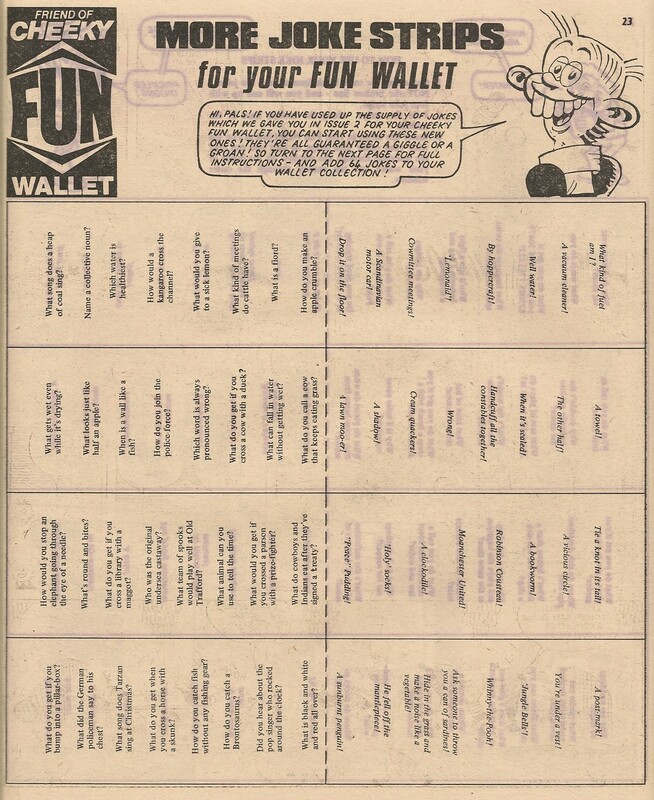 Whereas there were 4 different Fun Wallets, each with a separate set of jokes, the gags printed on the 'More Joke Strips' pages were of course the same in every copy of Cheeky Weekly. Approaching another Friend of Cheeky in the playground armed with this latest batch of jokes was therefore likely to be futile since both parties would know all the punchlines. 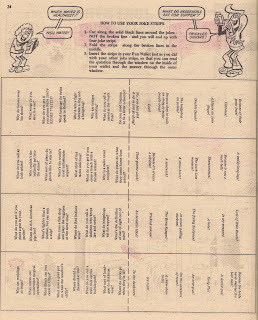 I would imagine that trying to slide the flimsy newsprint into the slightly more substantial card from which the Fun Wallet was constructed could prove problematic, and if successful, I doubt the additional joke strips would survive much more than a couple retractions and insertions before disintegrating. The artwork at the top of the second page is a cut-and-paste assemblage culled from a panel on page 31 of the previous week's issue, in which the Fun Wallets were given away. Also lost to posterity - as well as the strips themselves, what collateral damage would result from removal of the feature in question? 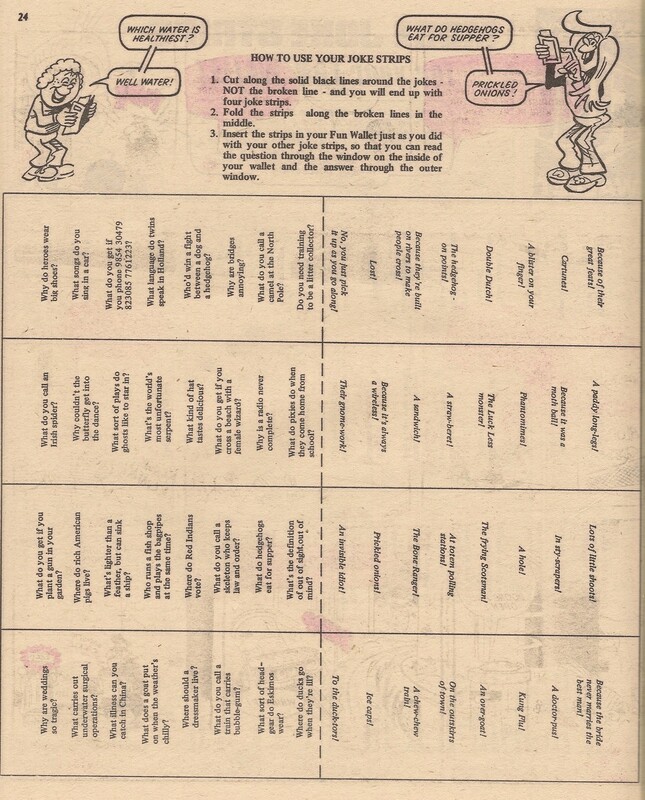 In order for the joke strips to function, the gags and punchlines had to be printed on each side of a single sheet of paper so, providing readers carefully cut around the jokes as per the instructions, no other elements would be lost from the comic.